Come to June Lake for a relaxing mountain experience, in a charming comfortable cabin. 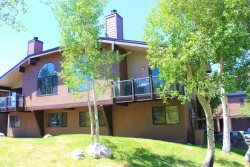 Perfect for everything your family and friends plan to do in June Lake. This vacation condominum looks over crystal clear Gull Lake and the surrounding Sierra Nevada Mountains. Spring comes alive with wildflowers, creatures, and of course the start of the fishing season. The trout are plentiful on June Lake, Gull lake, Silver lake, and Grant Lake. Summer offers more fishing, boating, paddle boarding, swimming, biking and hiking. So unique to the Eastern Sierra, do not miss the spectacular fall colors. Fall usually is a quiet, peaceful time of year with excellent fishing and cooler temperatures. When the snow starts to fall this cabin is only a five minute drive to June mountain Ski area. This ski area is great for kids, beginners, powder chasers, and back country skiers alike. Cross- country skiing is phenomenal in June as well as ice skating, if conditions allow. Also Mammoth Mountain Ski Area is only 25 minutes away! June Lake is an ideal central location is you want to explore more of the Sierra Nevada. There is Yosemite National Park, Bodie State Park, Devils Postpile, and the mysterious Mono Lake. At the end of the day come home to Interlaken 19 and relax on your deck watching the sunset and barbecuing with friends. Walk into the entry hall where there is plenty of room to hang your gear. The first bedroom is on the main level with two queen beds and attached full bathroom. Walk down the hall past the stairs to the modern, fully equipped kitchen with beautiful granite counter tops. The dining room table has seating for 8, plus additional seating for 3 at the kitchen counter bar. A wood burning fireplace between the living room and the dining room is sure to keep you warm and cozy. The comfortable living room has several chairs, a sectional couch and a 55" flat screen TV with DVD player. Open the sliding glass doors from the dining room or living room to the deck. There you will find a BBQ and relaxing deck chairs to enjoy the magnificent views of Gull Lake and the sierra! A washer and dryer is located behind the stairs to the second floor. Head up the stairs to bedroom two with two queen beds. This bedroom has an attached full bath. The master bedroom on the has a king bed, sitting area, TV and a full bath with a double sink. A quaint deck from this bedroom looks out over Gull Lake. My only personal interaction with you was when I dropped the keys off on our departure. Everything was smooth and I didn't need much help. I believe I emailed with Sierra & she was lovely. Sierra was very helpful, as was Lydia. I really appreciate you guys bending over backwards for us and getting us in this very special place. You were very easy to deal with. The only thing I'd like to say is that several of the light bulbs were burned out upon our arrival, or some of the lights didn't work. The place was awesome.